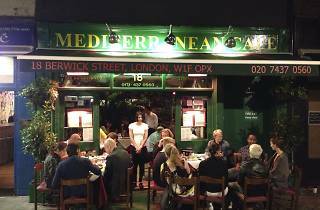 Mediterranean Café is a family-run Soho restaurant that has been trading since 1987. With over 25 years’ experience serving Turkish, Italian and Greek cuisine, it sources its fish from Billingsgate market and meat from Smithfield market. A downstairs bar is also available for private hire. Homely family restaurant located in the heart of Soho where you are welcomed by friendly and polite staff. 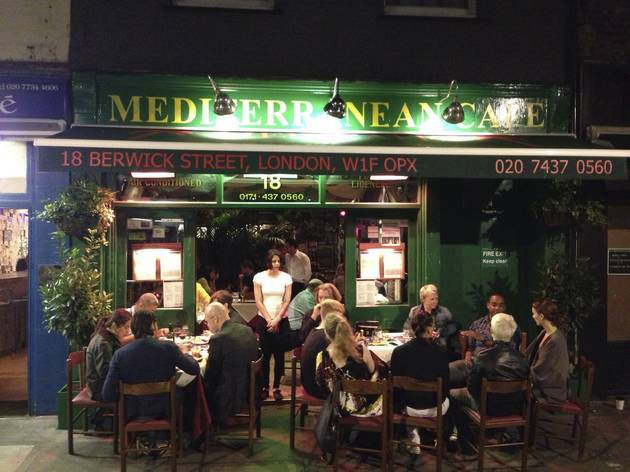 A great choice if in the mood for hearty Mediterranean food, especially pre theatre or in need of a quick meal. Although not a pre theatre menu, the fixed two courses for £15.95 offers large portions and is good value for money and service is quick, without ever feeling rushed. The Dolma is my recommendation as a starter, as they are cooked to perfection. This is place is now serving gözleme during lunch time from a window, and they are well worth the 4.5 quid a pop for full flavored one (down to 3.5 for single flavored ones!). These Turkish wraps have a very fine dough handmade and grilled on the spot, with choices of cheese, meat, potato and chicken to put inside. They do tend to baste them with a bit if fat while grilling, but it is some great tasting wrap option with loads of filling for a quick cheap lunch!